A lot of gamers have brilliant ideas but not really the chance to do something with them. 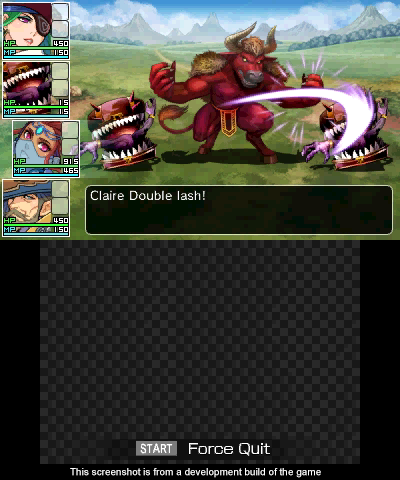 At least there are several possibilities to let your creativity run wild and one on the newer makers on the market is RPG Maker Fes for Nintendo’s 3DS. With this game, you can make pocket sized RPGs to your liking. Are you ready to dive into your own imagination? The good part of RPG Maker Fes is that you can create your own tale. No restrictions what you can do or make, your inspiration is the main source of the game, or many games you wish to create. For instance, if you want to create a fantasy-like story where you have to save the princess from the evil wizard that tries to cover the country in enormous piles of gummi bears, the floor is yours. Or, why don’t you create the opposite version of the most standard plot? Let the princess search for the hero as he doesn’t seem to rescue you. It is your choice how the protagonist responds to certain situations or how cruel some of the conversations are. Let your creativity run free. As this maker is on the Nintendo 3DS, it is only natural that you’ll be treated by some pixelated graphics. No need to worry though, as they are really nicely detailed and there surely will be something to your liking. At the moment of release, the game only had the Fantasy pack available, so don’t expect any modern or futuristic sceneries. The developers are releasing DLC regularly to provide you with new elements. Some of these aren’t free though, so if you’re looking for certain sprites it could be that you need to pay up. Since you decide the story, it is up to you in what setting you want to play in. Why not go full desert mode? Or let the characters roam in an ice-covered world where they need to look for some fire? Next to environments, there are also a lot of other possibilities like furniture, accessories and random clutter so you can go wild in decorating. 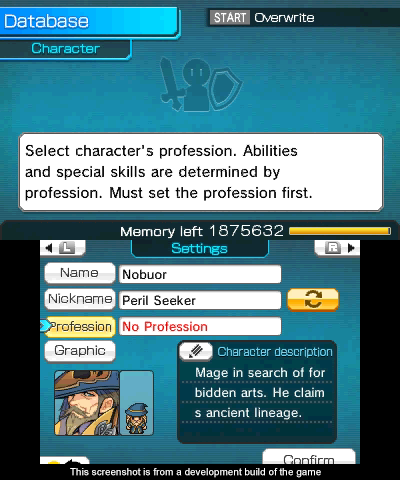 Regarding the characters, there are several predefined sprites from which you can pick. Each of these have different color schemes so there are a ton of options to choose from. One of the most important aspects of the game is the music and ambience and this is something that can also be customized. Each map can have its distinct track, which can be selected from a list. Each of them are made specifically with a certain theme in mind, like the jolly tunes for an inn or the sad music when you’re encountering a more emotional moment. Of course, it is your choice when you want to play a song, so go nuts. Just as music, the ambience can also be added. This is for instance when you create certain events and want to add some extra fun. In the end, you can choose how you want to let these effects shape your tale. 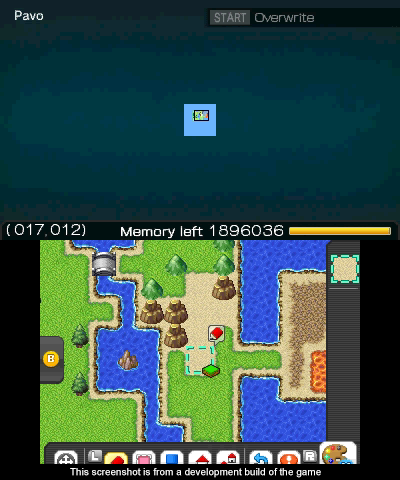 RPG Maker Fes is a way of making your own game(s) for the Nintendo 3DS handheld. You are bound to an amount of memory you can use but it’s more than enough to make a rather lengthy game. First of all, you can make several maps. The world map is of course one you certainly need to make, but you can also recreate several houses, towers or even cities in this section. It would have been nice if there was at least something along the lines of a tutorial or help section as it is quite hard to find out how everything works. You have several sprites available, divided in several sections. Some of them can be used as ground elements, while other ones are used as walls or decorations. You can choose between three different sizes so you can go wild in your creativity. Of course, making maps is rather fun, but you also need to populate it with characters! The maker has several sprites for you implemented, so you can go nuts. Running around is of course natural, but for any other events you will need to add actions. You can choose between several predefined procedures, like opening a treasure chest. Some actions like conversations require more work so you can make your own events for this. Just as with the map creation, some help would have been appreciated a lot as there is so much to do and discover. Now you will have to do a lot by trial and error, which might make you lose your interest or motivation rather fast. What is a game without weapons, armor or professions? RPG Maker Fes has you covered as well, with some programmed possibilities or some vacant slots for you to experiment with. In the end, you can create what you want, give everyone some weird jobs or let them use old rods for the whole game. After you created some content, you can choose to do a test run from the beginning or from the last point. This gives you the chance to see for yourself that everything works as it should be and to test the several events you added. It is cool to make your own game but where is the fun when you can’t share your creation. You can upload your game for free and others can download and play the story you created. This also works the other way around, as you yourself can enjoy what other developers have to offer. Plus, it is always a good idea to see what others made and get some inspiration from your next game. 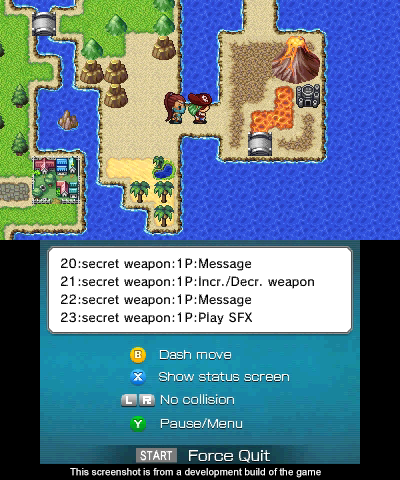 If you have enough time and you want to make your own Nintendo 3DS game, be sure to check RPG Maker Fes. You will have all you need to make the story of your dreams, although it would have been nice if there was at least a help function or some tutorials to get you on the road. In the end, you’ll get there but it might get you demotivated rather fast. Nonetheless, you have a whole new world, or worlds for that matter, only a few button presses away, all in the palm of your hand.